MONTREAL—Canada's 2010 Budget, released on March 4, 2010, addresses some crucial issues facing Indigenous peoples within its borders today. “Budget 2010 invests $10 million over two years to address the disturbingly high number of missing and murdered Aboriginal women. Concrete actions will be taken to ensure that law enforcement and the justice system meet the needs of Aboriginal women and their families,” according to the Canadian government's budget website. Director of the Native Women's Association of Canada's (NWAC) Sisters in Spirit (SIS) initiative, Kate Rexe, thought it likely, upon hearing this, that her work would continue to be funded. NWAC began its Sisters in Spirit initiative in 2004, for the purpose of doing research and compile data on the increasingly high numbers of missing and murdered Indigenous women and girls in Canada. On April 14th, 2010, SIS added 62 new names to the 521 cases of missing or murdered native women and girls it uncovered over the previous five years. According to Indigenous activists, this number is as high as 3000. This statistical discrepancy and quick increase, along with other numerical considerations, is seen by many as evidence that cutting funding to the research at this juncture is a huge mistake. According to NWAC's 2010 report, What Their Stories Tell Us, 226—or 39 per cent—of the cases identified to date have occurred in the past 10 years. Statistics on this matter were practically non-existent before SIS became what many consider the country's leading resource on the issue. In spite of the government's $10 million allotment, funding for SIS expired in March 2010. Budget 2010 named violence against Indigenous women a priority, yet there has been no word yet as to whether any of the money will go toward the six-year old initiative. Craig Benjamin of Amnesty International helped to complete the 2004 Stolen Sisters report in partnership with NWAC. “NWAC's list is from limited sources. It presents only part of a picture. ... Police record the ethnicity of victims only 60 per cent of the time. ...Most officers I've spoken to have no understanding of the importance of recording this info. Most see the term 'Aboriginal' as a physical description—if she looks like it, she is, if she does not look Aboriginal in their eyes, they don't record it. ...In the very fact that the numbers are unknown, we begin to get a sense of the failure of the government," says Benjamin. Rexe says that the Status of Women office, which funded SIS, has stated that there should be no more research, that now is the time for action. Critics point out that it would be impossible to measure the success or failure of any action without continued research. NDP Aboriginal Affairs critic Jean Crowder worries about the ambiguity of the government's funding commitment. “Our concern is that it's going to go all into policing [on reserves], which would be a major problem,” says Crowder. The Conservatives have yet to announce the funding allocation, and have not specified when they plan to do so. “Politically the government controls and manipulates the timing of announcements. ...It leaves organizations completely up in the air. And I mean that shouldn't happen. It's a new fiscal year. People need to know if they're going to continue to operate,” says Crowder. The government's lack of specificity in their financial commitments to First Nations programs in this year's budget is not an isolated incident. "When we heard that—mental health and support services—we thought, well, that's us," said Mike DeGagné, the Executive Director of the Aboriginal Healing Foundation (AHF). The AHF was established in 1998 and given a mandate "to encourage and support, through research and funding contributions, community-based Aboriginal-directed healing initiatives which address the legacy of physical and sexual abuse suffered in Canada's Indian Residential School (IRS) System, including intergenerational impacts." Less than two years after Prime Minister Stephen Harper's apology for the Canadian government's role in administering the IRS system, AHF funding has not been renewed in Canada's 2010 budget, leaving 134 foundation-funded healing projects across the country without the means to continue operating. Many organizations were forced to close their doors as of March 31, 2010, when the cuts took effect. The Native Women's Shelter of Montreal (NWSM), not as unlucky as some others, lost a third of its funding due to the cuts and has been forced to let three staff members go, including its sexual assault counselor. “Without the AHF funding, we can provide the basics like food and shelter, but there's a really high percentage of the women that come through that have been sexually assaulted. Now that we're getting our funding cut, we won't have that specialized employee anymore,” said Nakuset, the shelter's Executive Director. Co-founder of the Native Youth Sexual Health Network, Jessica Yee, speaks to why the budget cuts came as such a big surprise to most people. Although the AHF's funding agreement forbids any form of advocacy, supporters of the foundation have written letters, signed petitions, and even engaged in a few demonstrations and direct actions to convince the Canadian Government of the importance of renewing their funding. The report recommends that the government continue support for the AHF at least until the Indian Residential Schools Settlement Agreement (IRSSA) process is complete in 2011. The IRSSA provides payments to former students who lived at one of 139 officially identified residential schools, the last of which closed its doors in 1996. Half of the $199 million allocated to deal with residential school trauma is going to Health Canada's First Nations and Inuit Health Branch and half to the IRSSA. While the latter will provide small amounts of financial compensation to IRS survivors, the former will provide health services to individuals. But neither of these will do the work that the AHF was doing: providing culturally relevant, community-based, non-governmental healing programs. Many communities formerly served by AHF-funded initiatives do not even have Health Canada services in close proximity, making reduced accessibility to services another problem brought about by tearing down a well-functioning network in favour of one run by the government. “I looked at the Health Canada website, and the loops you have to jump through to access services is [sic] daunting,” says Crowder. Much as with the AHF, she says, Canada seems to be prioritizing the individual over the community in the funding case of the First Nations University of Canada (FNUC) as well. “They [the Conservative Government] continue to say that FNUC students can access post-secondary education. They're making it an individual thing, you know—students can choose where they want to go. But then they eliminate the choice by making sure the university [FNUC] is not funded,” says Crowder. FNUC, formerly Saskatchewan Indian Federated College, was established in 1976, and has been around in its current incarnation since 2003, with campuses in Saskatoon, Regina, and Prince Albert. In February 2010 the federal and Saskatchewan governments pulled over $12 million in funding from the university. Reasons given included allegations of questionable spending and delayed governance reforms. Due to the fact that FNUC has taken steps to address the requested changes (including a shared management agreement that gives the University of Regina financial control over the university), the Saskatchewan government's funding share of $5.2 million has since been restored, but the federal government has only restored $3 million of its initial $7 million to keep the university open until August 31, 2010, and has not committed to any further funding. Without federal funding, officials have said the entire university will close down. Since March 2010, students at the Regina campus have staged sit-ins and marches to protest the school's potential closure. Professors have held lectures to demonstrate to federal Indian Affairs minister Chuck Strahl the importance of Indigenous-based education. One student has been sleeping in a teepee outside the university since mid-March and continues to do so. In spite of these actions, lay-offs have already become widespread. On May 3, 2010, FNUC president Shauneen Pete announced that the Saskatoon campus was for sale, due to the institution's fast-growing debt. Manipulating the timing of announcements crucial to First Nations' organizations funding considerations, using language that is misleading to many, and demonstrating a preference for non-Aboriginal-run institutions over the alternative, even when Aboriginal-run institutions are proven to be the best at what they do, are all governmental budget ploys that should not be seen as new by any stretch, according to both Yee and Crowder. According to Yee, Native and non-Native activists alike are now faced with the challenge of better organizing themselves. 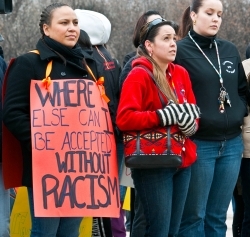 “They've [Aboriginal people] got to get mobilized,” says Priscilla Settee, a Cree First Nations community activist, academic, and former teacher at FNUC. 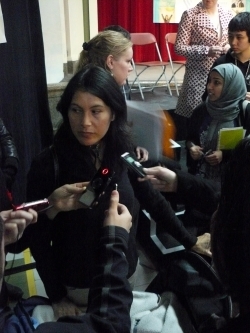 Maya Rolbin-Ghanie is a Montreal-based journalist and activist.